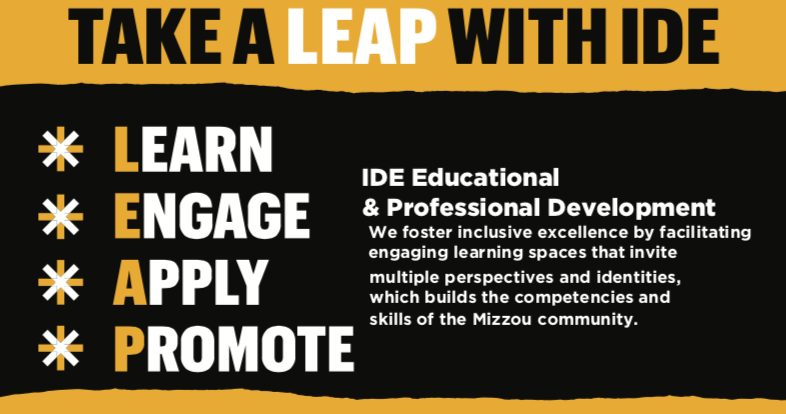 The Office of Inclusive Engagement fosters inclusive excellence by facilitating engaging learning spaces that invite multiple perspectives and identities, which builds the competencies and skills of the Mizzou community. Learn: Educational sessions will present up-to-date information about concepts backed up with evidence-based research and delivered in a succinct, understandable, and practical manner. Engage: Educational sessions will create and hold spaces for elevated conversations. Here, the facilitator will enable and encourage sense making, discussion, and information processing through open-ended questions, respectful deliberation, and meaningful interactions. Apply: Educational sessions will serve as laboratories for participants to test new ideas, put in practice newly learned concepts, and operationalize different constructs. Ultimately, ‘practice’ here is understood as a continuous rehearsal where knowledge is exercised and maintained. Promote: Educational sessions will equip participants with transferable knowledge and skills that can be carried out outside the sessions. Participants will be invited to expand, reproduce, and circulate the outcomes of the sessions. Note: These steps are not sequential or mutually exclusive; they build on each other, intertwine with one another, and permeate the entire Inclusive Engagement sessions. A typical 90-minute session will look like the following, however sessions can be adapted to any time frame.